A smartphone for every farmer. That's the vision of an R&D team from National Chiao Tung University. This group of professors and students has created a "smart" system for growing turmeric root. The system is linked to a smartphone app that lets farmers manage the farm and optimize their harvest with a few taps of the screen. In the pilot stage, the smart farming system helped farmers boost the nutrient content of their turmeric, increasing their commercial yield by 3 to 5 times. Whip out the phone and pull up the app. With a few taps, you can set the bug lights on the farm to automatically switch on at night. Give it another tap and the sprinkler comes on a few seconds later. You can turn on the fertilizer dispenser this way, too. This high-tech system has helped farmers grow turmeric roots that contain three to five times the standard amount of curcumin, the active ingredient in turmeric. The entire turmeric root is edible. It has a high output value. We wanted to focus on turmeric to create a management and control system for root vegetables. In the future, we’ll direct our efforts to high-value crops used in Chinese medicine. This smart agricultural system enables the precise monitoring of all aspects of the crops’ environment. Variables such as pest and disease controls, soil fertility, moisture, light, and temperature can be adjusted using the app. Information on fertilizer, pesticides, irrigation and even the day’s weather – all that information is uploaded to the cloud. We can keep track of products using this control system. Through this, we are industrializing agricultural production. The team’s goal is to use smart technology to transform traditional farming. 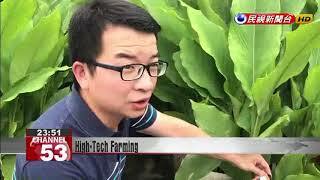 The team also aims to launch their system abroad and show the world what farms in Taiwan can do.